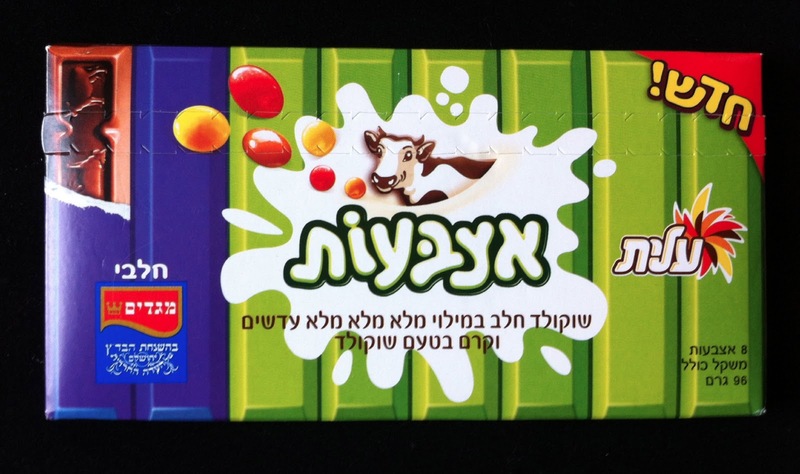 Maybe I'm biased by this alluring and whimsical packaging, but I am really enamored of the Chocolate Cream Filled Fingers, by Elite, Israel's largest candy manufacturer. The outer packaging hosts a welcoming cow and the byline touts "made of milk chocolate, full, full, full of chocolate-flavored cream." Crack open the outer box and there are eight individually wrapped bars about the size of a Kit Kat wrapped in the most cheerful foil designs. 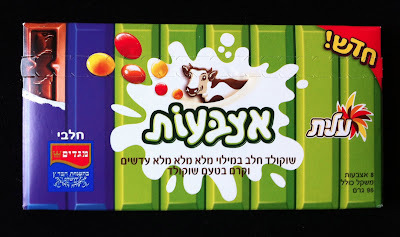 By the time I got to the cow-topped chocolate bar, I was in love. The process of unwrapping this candy is simply such a pleasure. 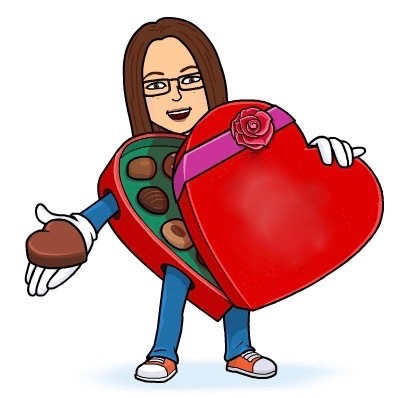 All that said, the chocolate is good, too. The interior chocolate cream is buttery and rich and melds pleasantly with the exterior chocolate. It's really sweet. If you're someone who prefers a bite of graded dark chocolate, these Fingers will not appeal to your tastebuds. But as a true sweet tooth, I can't stop indulging. Thanks to Shoshana for the Purim treat and to Abe for translation assistance! I adore this packaging! Where can I get this in Northern California?